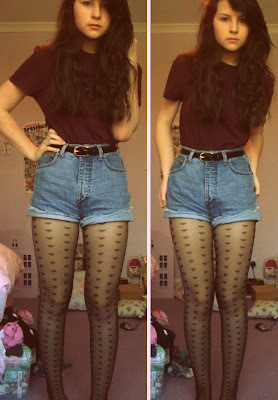 topshop heart suspenders and topshop heart tights; £8 each. i wore the heart tights along with this to brighton: marroon pocket top; stolen from my brother, cut off levis; £4, belt; primark; £2. topshop playsuit; £35. floral primark skater dress; £8. american soccer tee; vintage shop in brighton; £3. american college top; vintage shop in brighton; £3. The tights are amazing - love em! my god you are fabulous! I love the Topshop and Primark pieces! Crazy over the hearts too. Those are very hard to find where I live. love love love love love the tights. I've seriously been eyeing off love heart tights for so long, I really should hurry up and get a pair already. Which vintage shop was it? they are incredibly good deals! Your so gorgeous! And an amazing bargainer!